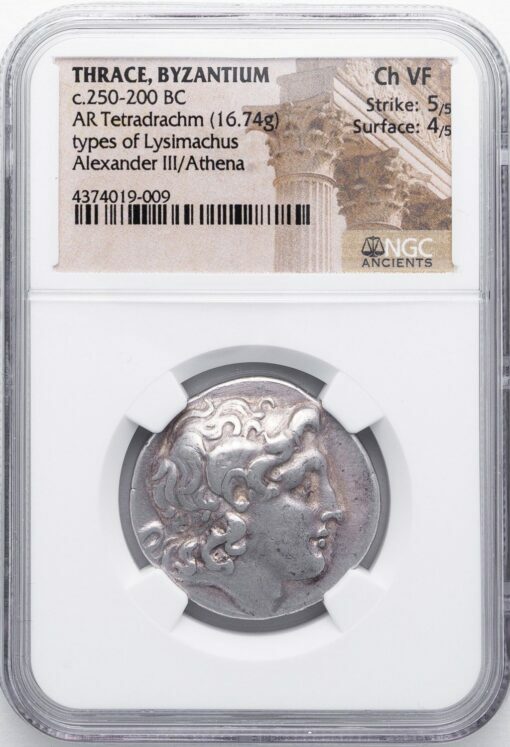 Silver Tetradrachm, 16.74 g., 30 mm, a posthumous issue of Byzantium, ca. 240-230 BC. Obv. Head of deified Alexander the Great right, with the horn of Amon. Rev. ΒΑΣΙΛΕΩΣ ΛΥΣΙΜΑΧΟΥ, Athena enthroned left, holding a Nike crowning Lysimachus’ name, ΦΛ monogram in left field. Marinescu, Issue 41, cat. 111 (same dies). NGC graded CHOICE VF, Strike 5/5, Surface 4/5.